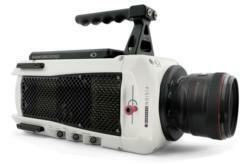 The v641 has become the industry standard in capturing many large sporting events around the world. Vision Research, the leading manufacturer of the industry’s broadest line of digital high speed cameras, is pleased to announce that Digital Video Sud (DVS), the French-based super slow motion services leader has chosen the Phantom® v641 digital high-speed camera to capture some of the premier sporting events happening in Europe this summer. DVS provided slow motion broadcast coverage of the Football World Cup in 2010, ATP grand slams like Roland-Garros 2011, Formula 1 Grand-Prix such as Monaco 2011, among other high-profile events. Currently, DVS owns 19 Phantom cameras, including the popular v641 which is integrated into the DVS SuperloupeTM solution, a leading patented system in the broadcast industry since 2004. DVS provides on-site 24/7 support for super slow-mo cameras, slow-mo dedicated OB Vans, EVS servers and experienced technicians. The v641 features 1920x1080 HD-resolution at up to 2560 frames per second. Unique to the v641 is a dual HD-SDI video system that allows the camera to acquire images in real-time while simultaneously playing back previously recorded clips. Superb light sensitivity means high quality images, even under the most challenging lighting conditions. The camera’s interface and control protocol provide maximum flexibility to integrate with broadcast infrastructure. Follow us on Twitter at @PhantomHiSpeed or friend us on Facebook at “visionresearch”. Wayne, N.J.-based Vision Research designs and manufactures the industry’s broadest line of digital high speed cameras for use in a wide variety of industries. Vision Research products have proven indispensable capturing the unseen in applications including defense, automotive, engineering, science, medical research, industrial manufacturing, packaging, sports broadcast, TV production and digital cinematography. In addition to earning both Emmy and Academy Awards® for innovations in technology and engineering, Vision Research has been presented with numerous other research and development honors, recognizing its achievements in high speed digital camera technology and sensor design. Marketed under the Phantom® brand, Vision Research digital high-speed cameras add a new dimension to the sense of sight, providing emotion and extraordinary detail of events when it’s too fast to see, and too important not to™. For additional information regarding Vision Research, please visit http://www.visionresearch.com. Vision Research is a business unit of the Materials Analysis Division of AMETEK Inc., a leading global manufacturer of electronic instruments and electromechanical devices.